I'm a firm believer that pretty much anything can be a taco. Agree or disagree? While I've never had it, there is a restaurant here in Atlanta that even serves mac & cheese tacos. Carbs wrapped in more carbs does seem a bit overkill to me, but hey - why not? So I fully realize that okra tacos may seem a bit out there for some. But here's my argument: we eat veggie tacos all the time, so how is this any different? The okra is pan-fried with a crispy cornmeal coating, and I topped it with some fresh pico de gallo and homemade ranch dressing. I wanted to add a corn relish as well, but our corn didn't look so great. And after the fact, I thought of topping with pimento cheese queso instead of the ranch for a truly southern taco - next time! 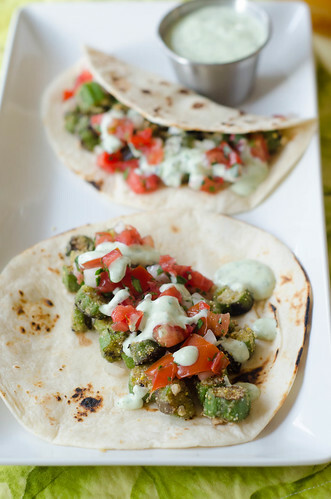 These hit pretty much all the taste buds and preferences - soft flour tortillas, crispy, crunchy okra, spicy pico de gallo, creamy ranch dressing.... it's all here. I have a new favorite taco. Fill each tortilla with okra and pico de gallo. Drizzle the top with ranch dressing and serve. Okra is the vegetable of the moment! And I agree with you... You can make anything into a taco! right now I'm craving shrimp tacos! I love this idea! 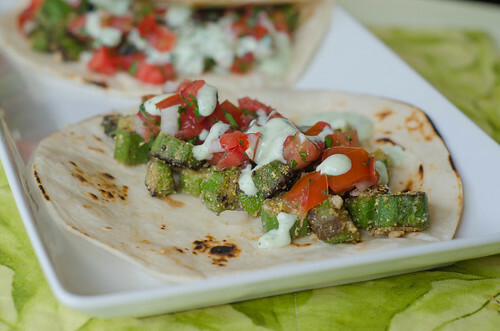 The okra looked yummy on its own, but topped with pico and ranch and wrapped in a tortilla? Brilliant. This is definitely going on the taco tuesday menu!! As an okra lover AND a taco lover, I can say I fully and wholeheartedly think these look awesome! These look so good! I first had okra when I moved to Texas for college, it's so amazing! I need to make these, I bet my kids would love them. That looks so delicious! Yum! What an awesome idea! I am going to be making these! What a great idea! I've got okra in the fridge right now and am planning to fry some tonight to go with chicken and coleslaw. Tomorrow night I had black beans/rice/corn/tomatoes in tortillas on the menu. I think I'll fry extra okra tonight and try an okra taco tomorrow, too. Girl, you KNOW I love these. Okra is so tough to find here (sad but true) but these tacos have given me renewed drive to locate some! I am firmly and securely in the LOVE IT camp! And I love cornmeal-crusted anything also. WIN. Looks delicious! Definitely making it! the most southern thing i can think of!! :) little Smith is so adorable! I've never made or had okra but we have some in the fridge from our CSA and I had no idea what to do with it!! I'm definitely going to give this one a try!